Norwegian trombonist Erik Johannessen is a very busy musician: he is a member of the left-of-center Norwegian jazz outfits Trondheim Jazz Orchestra, Jaga Jazzist, Lord Kelvin and Magic Pocket, and contributes to recordings by artful songwriters such as Susanne Sundfør and Synne Sanden, so it is no surprise that he has only now released his first solo album. 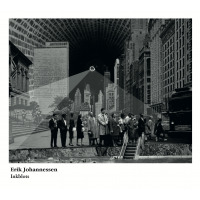 Luckily, Johannessen justifies the waiting by a beautiful set of short compositions which accommodate the rich vocabulary of his instrumental sounds. Johannessen can produce extraterrestrial noisy sounds, swing hard, improvise freely on the spot or sing through his horn. He carries his themesdescribed as inspired by "comic books, mythology, European buildings, New York and the Rorschach test"with melodic charm and playful humor. He is enjoyed by the tight rhythm section of bassist Jon Rune Strøm (of the Frode Gjerstad trio), and young Magic Pocket drummer Erik Nylander. The music travels between moods: from the meditative opening, "Swamp Thing," organically to the fiery "A Comedian Died in New York"; naturally, from the cinematic "Gramercy Riffs," the elegiac 'Mystic," tone poem "The Wooden Crane of Gdansk" and experimental "Liberty Bridge" to the twisted structure of the title piece. Johannessen leads his trio through this sonic adventure with charismatic power and assured playing, and leaves enough room for Strøm and Nylander to solidify the compositions. His playing is rooted in the modern and free jazz legacy, but has its own personal sound and language. Johannessen's idol, trombonist Øyvind Brække, guests on three playful pieces. The humorous "Whale Song Sing-Along," the melodic "Jeff Smax," and a poetic cover of Bill Frisell's "Egg Radio," from the guitarist's Gone, Just Like a Train (Nonesuch, 1988). Track Listing: Swamp Song; A Comedian Died in New York; Gramercy Riffs; Mystic; The Wooden Crane of Gdansk; The Gap; Liberty Bridge; Inkblots; Every Day; Whale Song Sing-along; Jeff Smax; Egg Radio; Fiddler's Green. Personnel: Erik Johannessen: trombone; Jon Rune Strøm: double bass; Erik Nylander: drums; Øyvind Brække: trombone (10-12).